July 20 to 29, 2017. 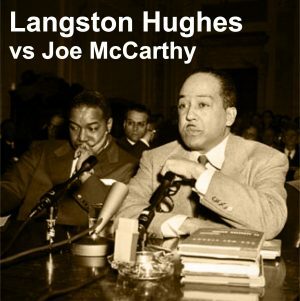 Artword Theatre participates in the 2017 Hamilton Fringe Theatre Festival with a timely and sensitive piece of documentary theatre, Langston Hughes vs. Joe McCarthy, written and directed by Ronald Weihs and produced by Judith Sandiford. 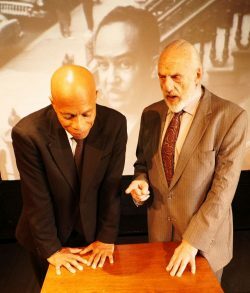 Dancer-choreographer-actor Learie Mc Nicolls plays the role of Langston Hughes and character actor Howard Jerome performs as The Interrogator. The script itself is based upon actual testimony given when Harlem poet Langston Hughes was called to testify before Congress during the Communist ‘witch hunts’ of the early 1950s. Back then, anyone who had ties to socialism, communism or even just leftist sympathies were blacklisted, vilified and forced to recant their views. Many of the artists and writers who were called to testify, even some of those who attended and just used their constitutional right to plead according to the Fifth Amendment, were unable to find work in their fields afterwards; many committed suicide, moved abroad or even, worst of all, they named others in order to be exonerated. Uncooperative witnesses were imprisoned. Refusing to testify – to name names of others – created heroes such as the ‘Hollywood Ten’ which included Dalton Trumbo. We revere their courage to this day, as evidenced by the number of films, plays and books that remind us their story. This is the era in which the play lives. From the opening moments, tidying up his desk and organizing his thoughts for the session ahead, Howard Jerome as Senator Joe McCarthy drives this production with his articulate and persistent attacks. His voice has a wonderfully raspy quality to it, that got under your skin. Called to testify is poet Langston Hughes (in this production played by the mercurial Learie McNicolls). He responds to McCarthy’s questioning by relating his experiences grown up in Missouri, and by sharing his poetry, he gives a basic lesson in creative writing and attempts to explain, correctly, that the narrative voice in a poem may not necessarily be the author’s own. It is often hard to stage poetry. This production presents eighteen of Hughes poems as part of the story; they are presented as dance pieces, and slipped seamlessly into the dialogue of both actors. “A poem is not testimony” Hughes asserts, perhaps not, but it can convey truth and meaning. We might wax nostalgic for a prosecutor who at least tries to establish actual facts in a legal case; in this our era of Trump’s 140 word ‘covfefe’ tweets, truth can be hard to find. But the agenda here is much the same, to silence those who do not subscribe to the politics of bigotry and hatred of the ‘other’. An additional character is created in this production, by the use of very cleverly chosen period photographs. In the exact same way that carefully chosen music works to underscore a scene, the images presented behind the onstage action become a powerful commentary. They evoke the time, the place, and the people brilliantly. A fine play, well staged, with a powerful message that is so important in our ‘here and now.’ What more could one ask for? A cool drink perhaps. 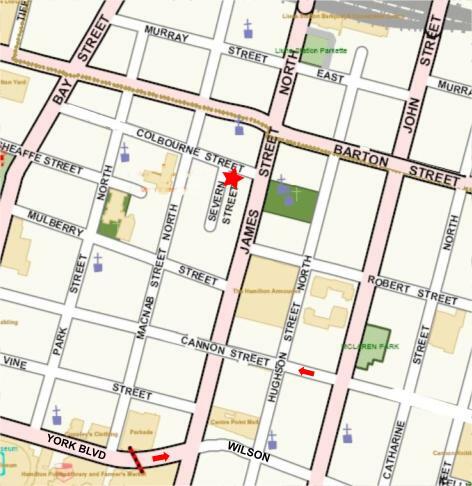 This venue is licensed and you can enjoy a beer, or a glass of wine, while you watch. Republican Senator Everett Dirksen and attorney Roy Cohn originally interrogated Hughes, but Weihs successfully embodies the men in one domineering character. The interrogator, clearly Hughes’s intellectual inferior, tries unsuccessfully to get Hughes to admit his poems contain subversive political messages. Instead, Hughes takes every opportunity to school his interrogator on the true meaning of free speech — a lesson the current U.S. administration desperately needs to hear. What makes this production really sing is when Learie Mc Nicolls brings to life the words of Langston Hughes. More than once the audience would burst into spontaneous applause at the end of one his powerful recitations. Not only did his voice bounce off the walls, but his feet and body were bouncing and moving all over the stage. Mc Nicolls was utterly captivating to experience and witness in this fully realized performance. The counter point to his poignant energy was the brittle intensity that Howard Jerome brought to his role as the nefarious McCarthy. Seeing how beautifully Weihs brought together his overall vision there was one oversight that kept bringing me out of the trance I was being put under. Neither Mc Nicolls nor Jerome look or sound anything like the real life people they portrayed on stage, but Mc Nicolls was magnificently dressed with trim, polish, spit and shine while Jerome had an ill-fitting suit, frumpy pants, grey beard, pony tail and running shoes on. I just wished that Jerome’s costume and overall look better expressed the evil, uptight, controlling, power hungry, repressed character he was portraying. He looked more like an eccentric hippy professor not the man who coined the term “McCarthyism”. Nevertheless a minor detail in what was a truly enchanting hour showcasing some of Hughes’ moving, political, and still frighteningly relevant poetry. Writer/ director Ronald Weihs has assembled an acting powerhouse for this 60-minute drama. Dora Award-winner Learie McNicolls is Langston Hughes, renowned poet of the Harlem Renaissance, and Howard Jerome is Joe McCarthy, a U.S. Senator known for his pursuit of anyone affiliated with Communism in the 1950s. The play is based on actual transcripts of Hughes’ testimony before the Senate Permanent Subcommittee on Investigations in March 1953. But this isn’t a courtroom drama and there’s no thundering climax. Instead, the play features McCarthy asking Hughes questions about his poetry. Seated, Hughes answers but then rises to narrate a poem. A skilled dancer, McNicolls artfully adds to his delivery of these poems, which punctuate issues such as workers’ rights, racism, inequality and religion. Weihs also tackles more philosophical topics such as whether a writer’s views be separated from his work. Weihs also uses music and projects photographs of the actual court proceedings plus other images of the era on a screen behind Hughes’ courtroom desk to remind the audience of the societal tensions of the 1950s. Of course, looking at a sign that reads, “We want white tenants in our white community,” forces audience members to consider our current climate on racism, Islamophobia and xenophobia. Despite top-notch actors and a unique, artful structure, this production’s hindered by its overly ambitious script, which, at times, seems more intent on raising issues than offering any attempts at resolution.